"Les fées sont d'exquises danseuses"
Hommage à S. Pickwick, Esq., P.P.M.P.C. Swiss-born Elisa Marzorati (b. 1977) was raised in Venice by her musician parents, Franco Marzorati (double bassist) and Marianne Fischer (flutist). From age nine she studied piano; her teachers include Giorgio Lovato at the Venice Conservatory, Lucia Romanini in Milan and Giorgio Vianello in Venice. Marzorati also studied chamber music performance at the Zürich Musikhochschule with Eckart Heiligers. She earned several degrees, including a Masters in Ethnomusicology at the Ca' Foscari University of Venice. She also studied jazz performance at the Zürich Musikhochschule and Taller de la música in Barcelona. She regularly appears as a soloist, as accompanist for singers, in chamber groups and performs with a rock-country band, Guido Marzorati & the Blugos. Quite a varied background, but now you ask, how are her Debussy performances? I must confess that I didn't know what to expect from this pianist because of that "varied background" and because I'd never heard of her. When I put the disc in my CD player the first thing I noticed was the piano's sound: it was a little spongy and cushioned in the bass regions and that, I thought, could well portend mediocre results. Listening to the first several preludes, however, I was pleasantly surprised by the assured performances: the playing was deftly imagined and quite subtle in capturing Debussy's often elusive Impressionist idiom. As I listened further I realized that Elisa Marzorati was a major talent, a pianist who played with intelligence and feeling in every prelude. Put simply, there are no misfires here – everything is delivered with attention to detail, to capturing the mood, the images, the sound, and the quaint but unique world of this iconic French composer. The opening prelude in Book I, Danseuses de Delphes, is graceful, elegant and utterly arresting. Marzorati's pedaling and legato seem perfect – nothing is harsh sounding; all is mesmerizing. The ensuing Voiles has an almost playful character in its gracefulness and mystery. Le vent dans la plaine calls to mind a blustery plain alright, but here too there is a sense of foreboding in the anxious swirls. Les collines d'Anacapri effervesces delightfully in its mostly chipper character. Ce qu'a vu le vent d'ouest is thrillingly played, again capturing another mood relating to the wind, this time a sort of angry wind. Marzorati delivers a lovely account of La fille aux chevaux de lin and her rendition of La cathedrale engloutie is subtle in capturing both the mystery and grandeur of this great masterpiece. She builds to the big climax with well-judged dynamics and judicious tempos, delivering one of the best accounts of this piece I know of. Marzorati is just as effective in Book II. She makes Brouillards, a piece that can come across as dry and even austere, come to life: here the Mists aren't gray but richly dark and mysterious, with a bit of menacing energy pulsing through them. She conveys the exotic and colorful character of La puerta del Vino in brilliant and subtle tonal shadings, her pedaling and dynamics once again seeming perfectly matched to the character of this Habanera. Another great success here is Ondine: Marzorati is by turns playful, mischievous, and even a bit threatening, catching all the elements of this colorful piece. Feux d'artifice brims with energy, nervousness and a sense of magic as the music exudes all sorts of color in its explosions of fireworks. For this review I sampled other sets of the Preludes, including the impressive one by Jean-Yves Thibaudet on Decca. Thibaudet is very tasteful and quite convincing, but he can be a bit cool. By contrast, Marzorati is warmer, at times even Romantic in lyrical passages, and she is always intelligent and sensitive. I have noted that the sound on the CD is a little hampered by spongy bass notes (it most probably is a characteristic of the instrument), but it is otherwise clear and more than acceptable sonically. 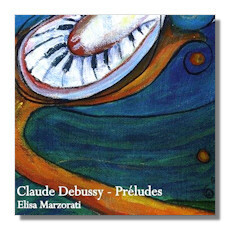 For anyone interested in the Debussy Preludes, this disc will certainly prove rewarding. As for Ms. Marzorati, I would say she is a talent awaiting further discovery. Perhaps this disc will yield the international notice she rightly deserves.